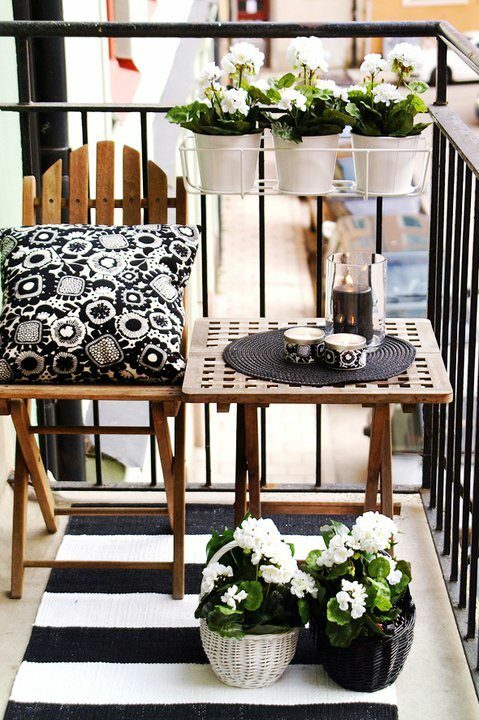 If you have a small porch, deck, or balcony…welcome to the club. My front porch is literally 6 feet by 6 feet… but I’m determined to make it a welcoming space. 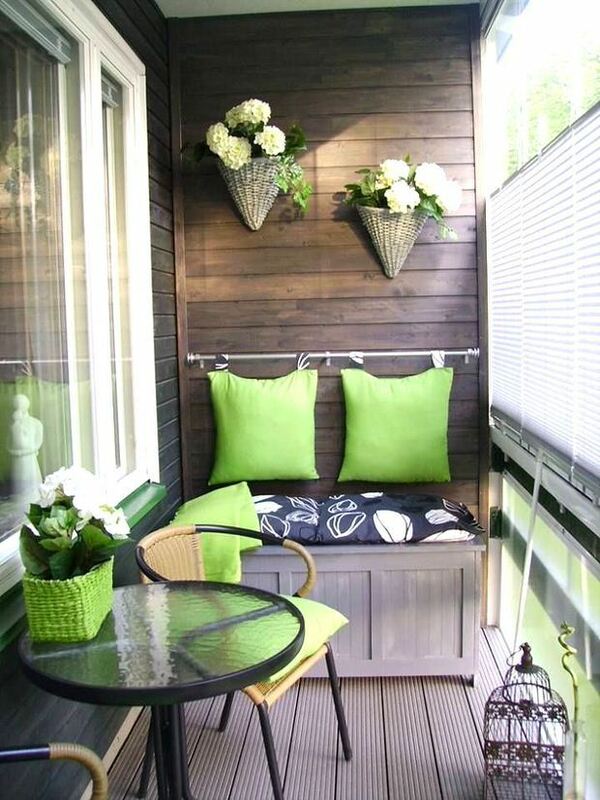 And you can make your small porch wonderful too, with these small porch decorating ideas and design tips… Not to mention the inspirational photos! 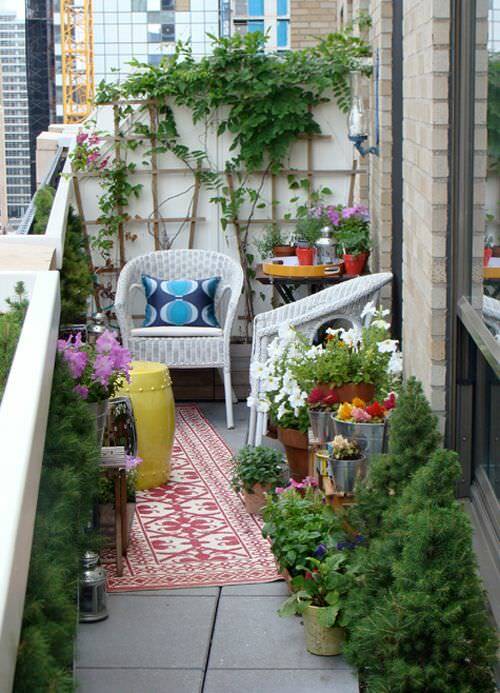 So create another room and find a way to use your small outdoor space to enjoy…well, the outdoors! This small front porch was done with an eye for details by Jewel Hazelton of Eat.Drink.Shop.Love for Home Depot. The color scheme stays simple in blues and greens to keep the space from looking too busy. An area rug defines the space as more than just a corner. Seating and a small table allow for a snack or a nice stack of summer novels, to make you feel right at home. Lighting is attached to the wall above. But details are important too, especially when viewed close up in this small space. Jewel paid attention to making the space interesting by painting pots, adding plants, and a patterned throw pillow gives the room some contemporary punch. Great ideas here! BHG has some great advice on decorating a small outdoor space… first, arrange the furniture so that you have room to move around! 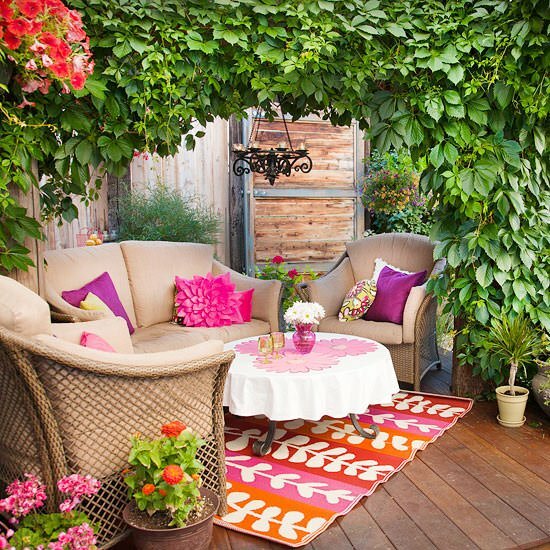 I love this deck, the trellis pattern area rug really pulls it together. You’ve seen projects on our site before from Four Generations, One Roof, because they are so creative! This DIY small porch was tackled like true DIY’ers… and you could easily find inspiration here in the colorful touches, the re-using of the chest as storage AND a table, and the simple idea of bringing the indoors out with the comfortable looking throw pillows and lantern for quiet evenings. Love it!